If the weather is still warm enough in fall to do an outdoor wedding event, go for it! When you set up outdoors, the sky is the limit where your decorating options are concerned!!! 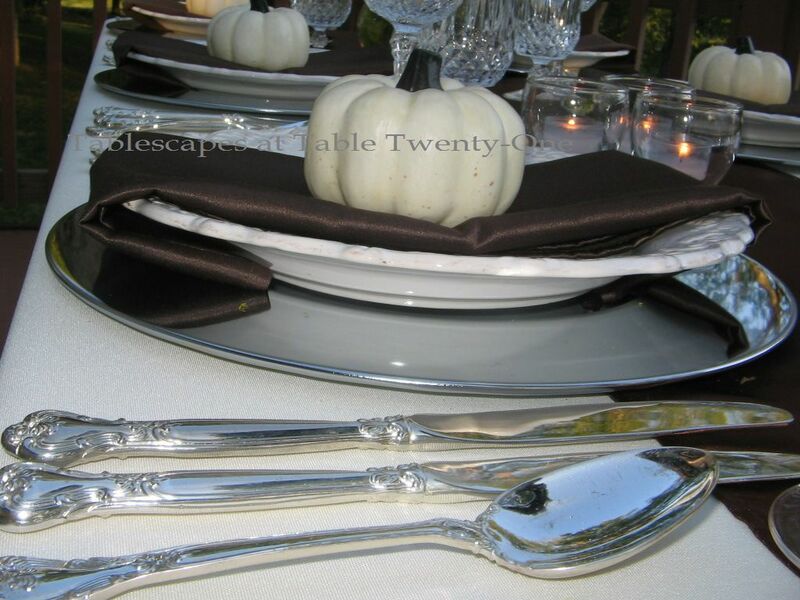 Keep the flatware along the same line of formality as the rest of the setting. The design on this flatware is similar to the pattern on the rim of the dinner plate. I went with Cristal d’Arques “Longchamps” crystal that offers a lot of bang for your buck. 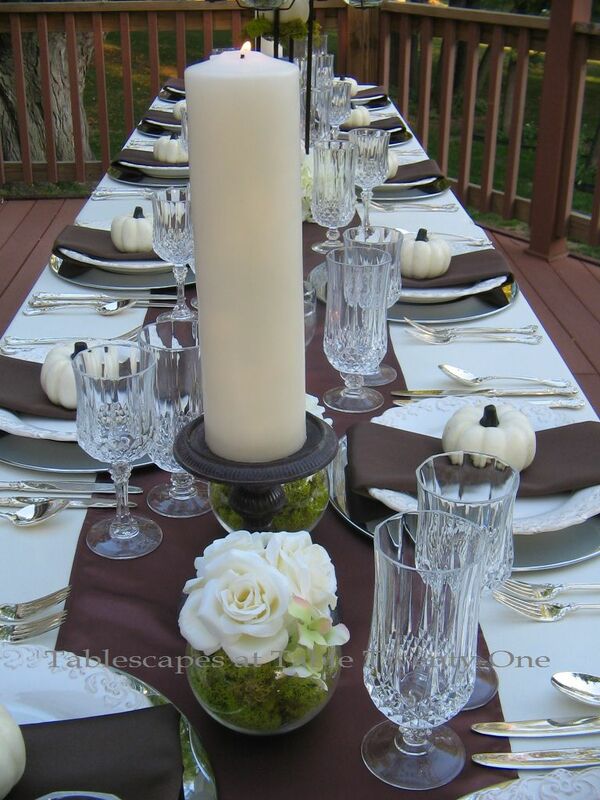 Long tables offer an opportunity to do so many cool things with the centerpiece! A mix of high and low arrangements fill out this 12-ft. table. For even longer tables (so cool to see 18-, 24-, or even 36-ft. tables!!! ), add more high ones to balance it out. For this table, I used a little wrought iron number I bought earlier this year. It’s reversible…or at least I made it that way by accident! Lesson learned? Play with your toys…don’t just use them the way they were displayed at the store!!! This is the way it’s used here, but it’s actually upside down and missing some parts! This is how it’s supposed to look. I finally figured out what all those “extra” mystery pieces were for! 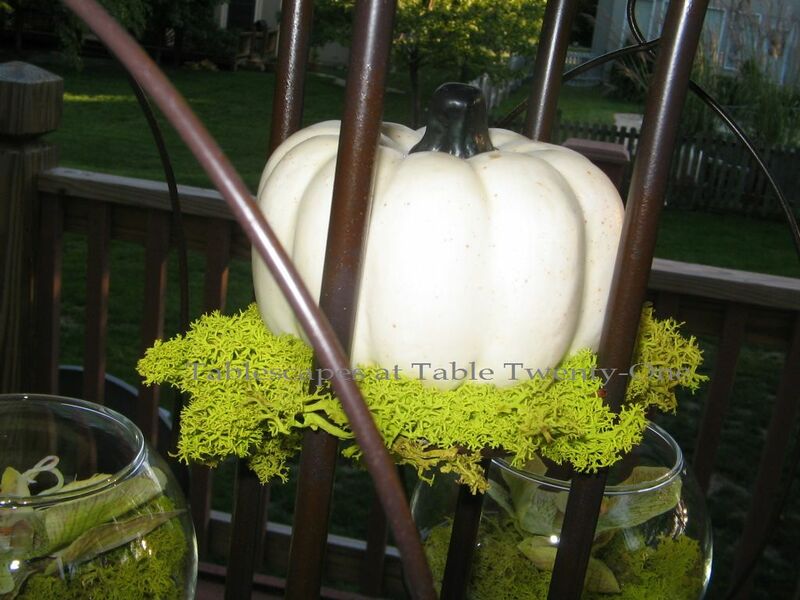 The ugly little spindly legs on the bottom part of the centerpiece are camouflaged with mounds of florals accented with reindeer moss and a white mini pumpkin. A mini pumpkin rests comfortably on a cushy bed of reindeer moss. I like the moss to look a little bit messy as nature would have it. The side globes hold a single orchid bloom atop more reindeer moss. 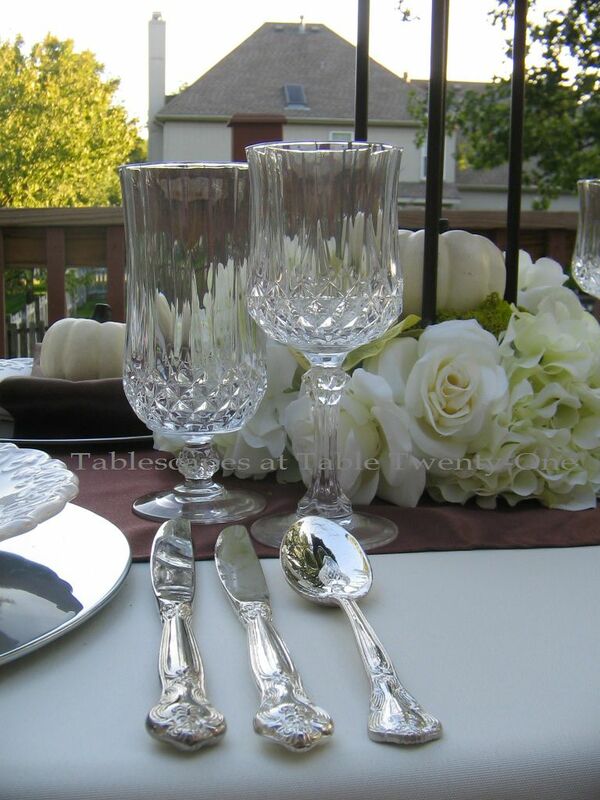 The smaller components of the extended centerpiece correspond with the main piece. Iron candlesticks with fat pillar candles are flanked by small rose-filled globes stuffed with reindeer moss to keep a consistent look. This same concept could easily apply to a winter wedding by swapping out the pumpkins with oversized ornaments. The look also works well indoors so long as the height of the centerpiece doesn’t interfere with overhead lighting, fans, etc. I’m hooking up with my pals at Susan’s Between Naps on the Porch for Tablescape Thursday again this week. If you’ve never visited, you really must! Lots of talent out there!!! A special shout out and great big thank you to Angie over at Echoes of Laughter who helped me figure out how to get rid of the bothersome “no reply” feature when I leave comments on other blogs. Teamwork paid off!!! I really like this one Alycia this is totally awesome !!! Where did you find that centerpece “toy” ? I would like to incorporate this idea myself. Hi, Andrea! Thank you! The centerpiece was purchased at a wholesale place awhile back, and unfortunately they no longer carry them because I would otherwise be happy to send one to you. I think it was only around $30. 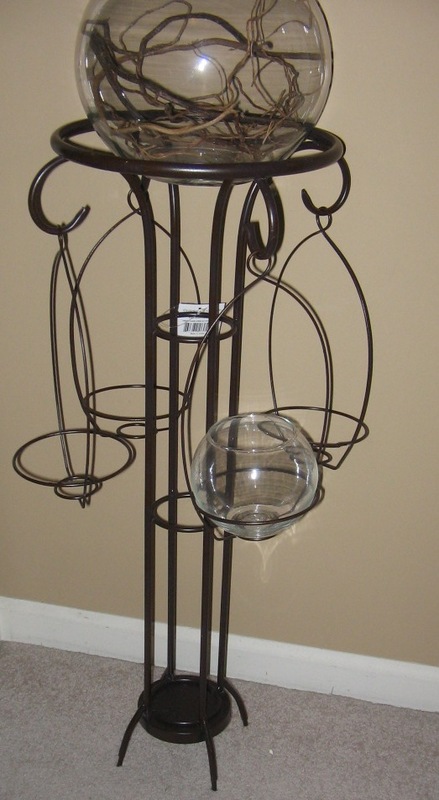 I’m thinking, though, that there are other items out there that are similar in construction…like certain candelabra? I have in the past wired a floral wreath to the top of a silver 4-branch candelabra, and it turned it looking fantastic! If I find a photo of it around here somewhere, I will send it to you. It has been about 3 or 4 years ago that I did it, so I’ll need to browse through those CDs. (That was back before I started using the little camera with the USB thingie.) One thing I do recall is that you have to really secure it! I not only wired it, but also tied rubber bands around the ties so that it wouldn’t move up and down the slick silver. Just a tip! I wish you had moved to Savannah… your incredible talent would be a short car ride away. Hey, Debbie! I’m so glad you like it, and I love the idea of incorporating plum. I’m sitting here looking at a plum-colored Mikasa goblet that I stole borrowed from my Mom, and I know it would look fabulous with those other colors minus the brown. Savannah was not meant to be, but you had better believe I’ll be getting in touch should we ever head that way again! Have a good night, and thanks for stopping in! Thank you, Liz! I like how you described it as an “organic” feel. That’s what I was going for. It’s sometimes just a matter of walking that fine line between a Euell Gibbons Grape Nuts commercial and an ad for Tiffany’s! 🙂 I do the same thing with reindeer moss…I reuse it ’til it’s good and dead! It’s too expensive to toss after a single use, and it seems to last practically forever! Hi, Marlis! I’m glad you like it! I wish I had a relative getting married sometime soon. All the girls are so “independent” and my son….well, let’s just say he’s in NO hurry to get to the altar despite having found someone who is good for him. But that’s a story for another day….! 🙂 Whenever someone specifically requests a table, I feel obligated to put in a lot of explanation. Makes it pretty wordy, but at least they get the 25 cent tour into my thinking! Alycia, my dear, I am so loving this tablescape!! It’s everything that I love! The chartreuse, the chocolate brown, the hydrangeas…it is sheer perfection!! The white pumpkins are just the icing on the cake! 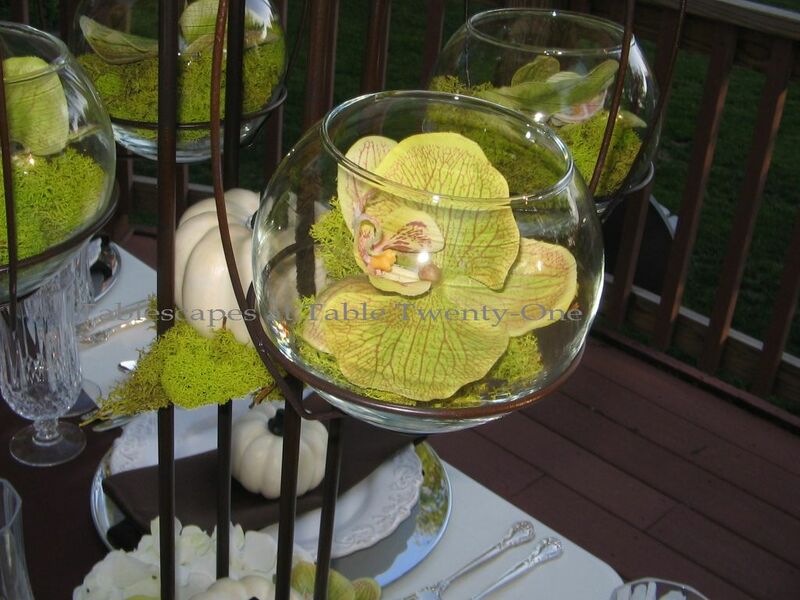 This is just such a fresh idea for a fall weedding. I agree with you…a monogram on the pumpkins at each setting would be just stunning! Great job!! I love fall colors, but this is a classic. It is classic white with the hints of fall. 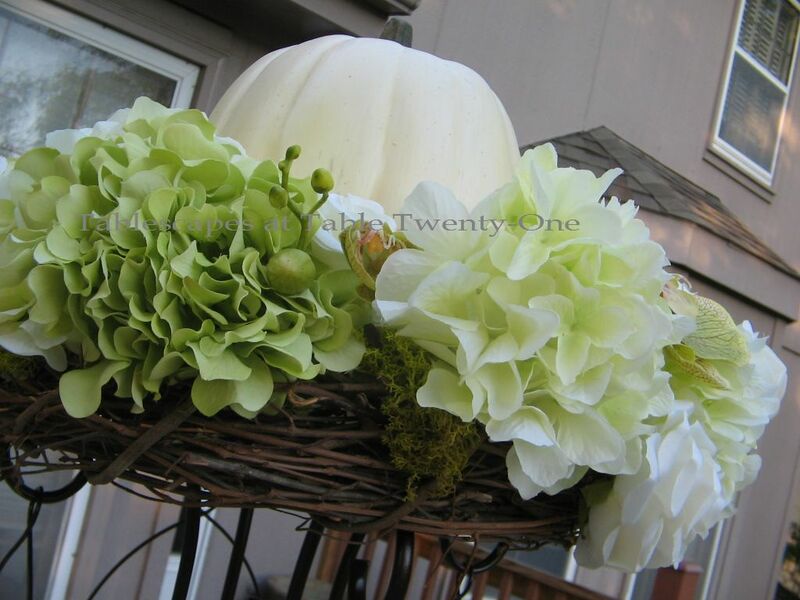 Love the chartreuse and white pumpkins. Alicia, you ALWAYS dazzle me with your tables!! Just today, I bought 10 of the mini mini pumpkins, but yours look perfect compared to mine. I think the flooding in the farm fields a month ago made water spots on the pumpkins. I am loving the classic white!! I know so many people’s farms got wiped out this year…it’s terrible! Here in the Midwest a lot of them were wiped out when the Corps of Engineers opened up a levy and let the water destroy everything in its path. Several states were greatly affected. So many people lost so much. Makes me wanna scream…and smack someone! 🙂 My pumpkins here were faux, so that’s why they look as they do. I would have preferred some that I saw at the store, but since this was a demo table I didn’t want to spend the money that I don’t have to begin with! I love this,so elegant! I am not an orange person, so this def speaks to me. Love the centerpieces,too. Just beautiful! You have done it again! You have a gift to share with everyone. Have you ever considered sending your blog to Nate Burkus? It would be wonderful to see you on his show with a challenge to arrange a table. I can’t even get these local yokels to respond, so I have no faith whatsoever that Nate would give me half a thought. 😦 I’m going to keep building, though, and who knows…maybe someday I’ll hit it! Great color combo and I love the TALL arrangements with the grape vine wreath and the hydrangeas, roses, and orchids. White pumpkins are the perfect Autumn touch. You did it again Alycia ! How do you come up with all these fabulous settings?? Oh, no you didn’t!!! I just visted YOUR most recent post, and YOUR creativity was bangin’!!!!! That centerpiece was so lush! Wow…you put in so many different elements that it just looked like the epitome of fall! I’ve never been comfortable with adding large fruits and vegetables to “standing” arrangements. I’m just scared I’ll mess it up. I need to practice. Yours looks so great, and the addition adds so much to the overall look. 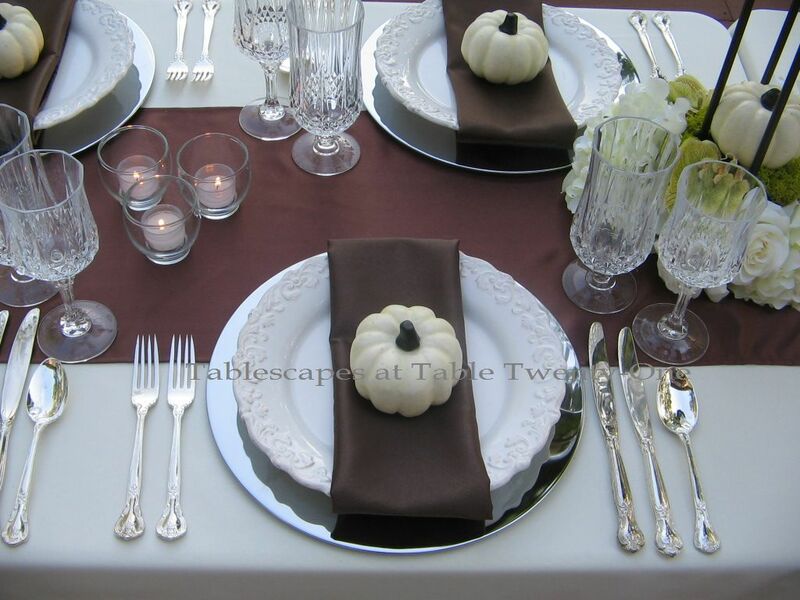 The centerpiece is a perfect companion to both the dishes and the tablecloth! 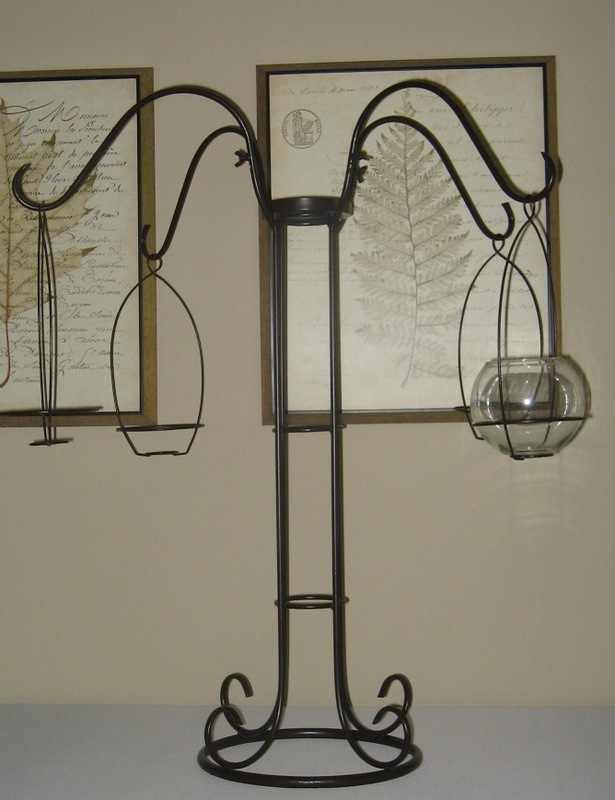 I’ve seen those wine bottle candelabra, and I think they are so cool. It IS a great way to enjoy the memory of the evening a bit longer. Thanks so much for stopping by, and have a glorious day! 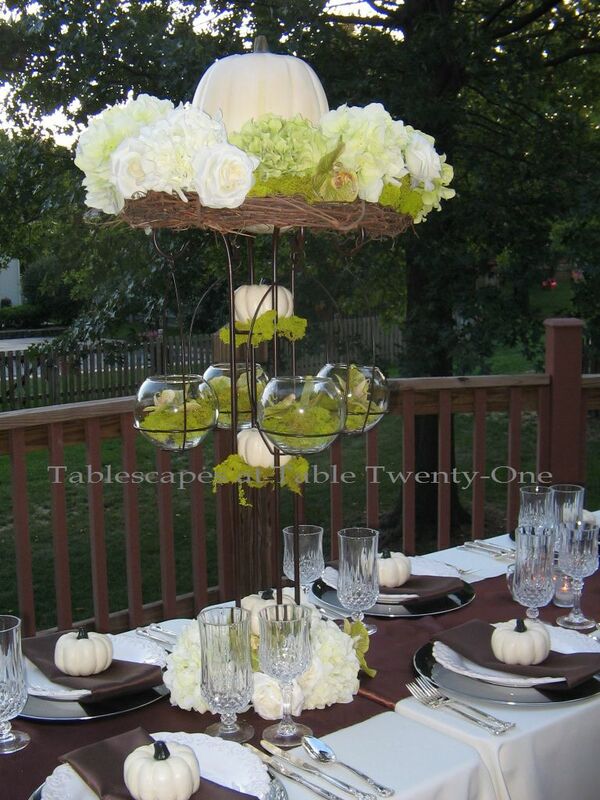 You keep doing such amazing high centerpieces! I just love this one and the colors are so soothing and beautiful. What a lovely combination of flowers too. I especially love the green orchids. Very, very pretty Alycia. Yes yes yes!! This is gorgeous. Love these colors! Love the white pumpkins and white flowers. Very elegant! Gorgeous table! 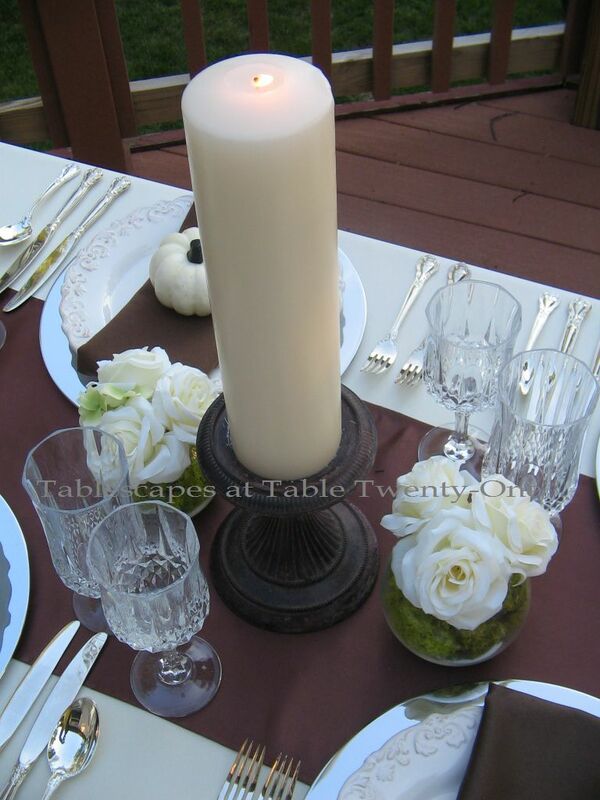 I love the centerpiece – I think it is better the way you used it than the original way!!!! 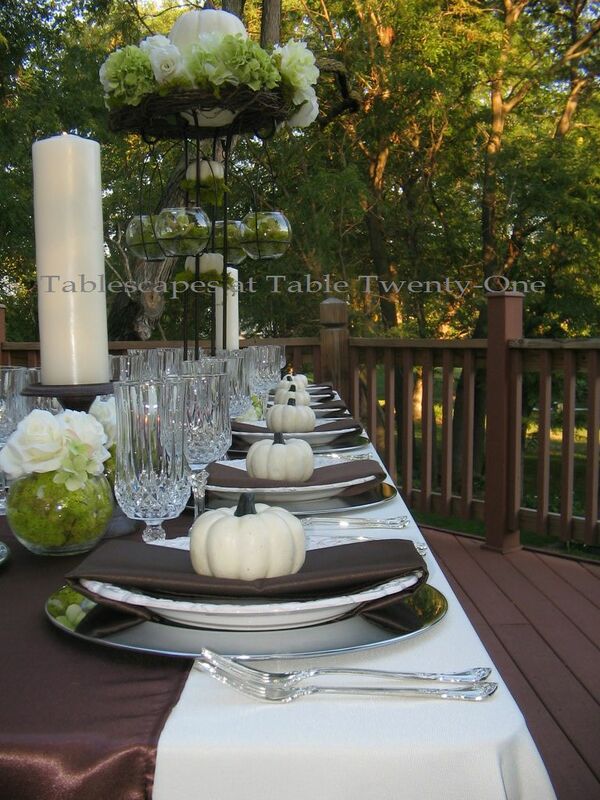 Love the whole color scheme and the white mini pumpkins! Alycia! This is a fairytale table! Perfect for a young bride. I can see how this would make a bride’s eyes light up! I think you got the color just right. LOVE browns, greens and white… so up to the minute chic! You did a masterful job with the center of the table. There are so many thing to feast our eyes on… while not letting it get busy! Your main centerpiece is a masterpiece! 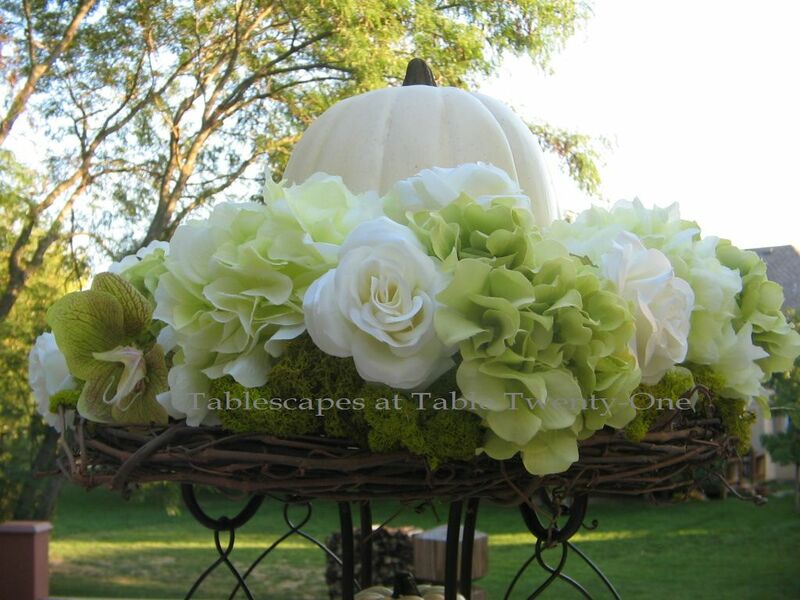 Such great elements… moss, roses, pumpkins, grape vines… WOW , you hit a rehearsal dinner home run! Great twist to the traditional fall colors. The arrangements look great! I love, love, love your color combination! I love the white pumpkin in the center of each plate. This is a beautifully thought out table! Thank you so much, Maria! I appreciate it!!! I was just reading your comments and your responses to them and I am sitting here with my mouth hanging open. I CANNOT believe that you have a staging area, too! I swear, girl, you make the hair stand up on the back of my neck. I have a bunch of post office letter bins (don’t tell that I never returned them) that I have lined up on the floor of my “vault” (read:storage room). In them, I start assembling different looks and when I think they are really percolating, I finish up the gathering and hunting and set that table. And how about that “can’t sleep” thing? When else would we get these good ideas? Do you have a pad of paper beside the bed and make notes in the dark? And here’s another eerie fact. The table I’m working on now for a luncheon for my bridge group is white with apple green. Are you just a little bit weirded out? Hope I can do mine half as well as you did. Love it! Oooooohhhh….I’m tellin’!!! 😉 That’s actually a great idea. Hmmmmm….thinking, thinking, thinking….!!! The staging area was my husband’s brainchild. He knows I need to be able to walk past ideas for days (sometimes weeks!) on end to really get a feel for them. He suggested a staging area so I could do just that…and it works out perfectly! It’s on the other side of my office, so as I’m flipping through my computer catalog (yes…I have EVERYTHING catalogued with photos, descriptions, measurements, number available, etc.!!!) I can easily figure out what works and what doesn’t. I add to each vignette a little at a time or however it comes to me. Works out great! I love your description of your “vault!” I have a little sign over one of the storage room doors that says, “The Good Stuff Is In Here”. What am I trying to do…tip off the burglars so they don’t have to search? No pad and paper by the bed. I usually get up and walk across the hall to my office and bookmark the pages of the computer catalog. It’s crazy, but it’s true! Good luck with your bridge group table! Can’t wait to see it because I KNOW it’s going to be fabulous. How could it be anything but???? See ya later, buddy! Elegant, warm and inviting! I always love to visit your super creative space. Thanks once again for sharing. Thank you!!! Enjoy your weekend, Sanghamitra! The color combination is absolutely lovely! And what a spectacular centerpiece! I’d feel really special as a guest at this table! Thank you, Dianne! Have a great weekend! just beautiful! I had a November wedding and we used whites, creams and plums…this is really stunning! We’re kindred spirits, Meredith! The plum would be a fabulous addition to this. Hmmmmmm…..! Hi Alicia, this is a very cool color combination for fall! It’s amazing how you take something, like that fun centerpiece, and make it into something so beautiful. Great ideas, and another gorgeous table! I am always anxious to see what you come up with!! Thank you, Betsy! I love messing around with stuff and making it look different! My staging area is always hoppin’ with ideas! I’m afraid the table is going to collapse under the weight of it all if I don’t get crackin’! 🙂 Thanks for stopping by, and have a relaxing weekend! I love this color combo. I am already planning to use these elements for my fall front porch decorating next year. I think the reindeer moss is just stunning with the white roses and pumpkins. Thank you for sharing all your wonderful ideas with us! Hi, Taunnie! Thank you for coming by to see me yesterday. I’m glad you like this one. When you do your front porch, please come on by and do mine, too. I have been SO bad this year! Have a happy weekend! You are absolutely amazing!!! I, too, love this more subtle color combo for fall (though I also adore the traditional orange/red,etc.) 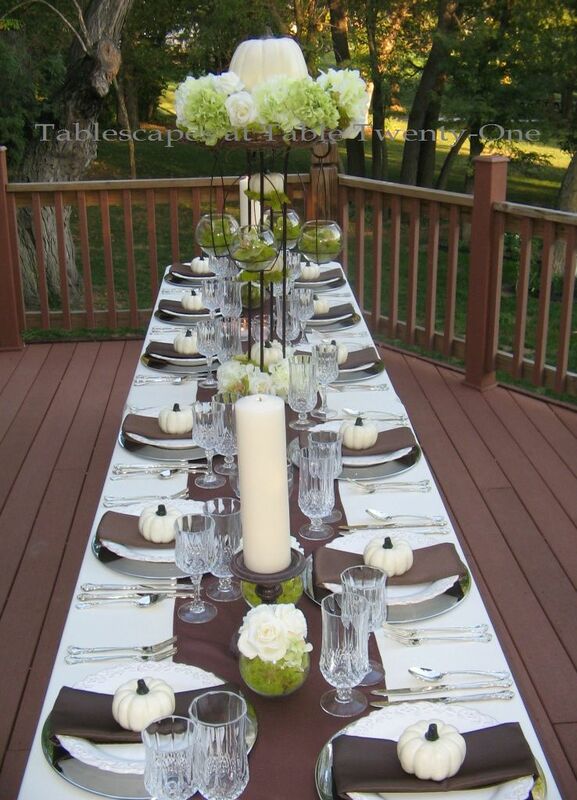 and this is TREMENDOUSLY ELEGANT….for a rehearsal dinner…for an actual wedding…for ANYTHING! Your attention to detail blows my mind EVERY SINGLE WEEK!!!! Hi, Lana! I thought you would like this! This seems like you!!! Thank you so much for stopping in! Hope you’re settling in OK! Every time I come to one of your posts, I think “well, of course everything looks so great, she probably spent a fortune.” Then I read what you’ve written and am reminded that you shop in the same stores I do. You just have an amazing way of putting things together to look uber expensive! Great choice of brown. Always more casual than black. I went to a wedding last weekend and white pumpkins were quite prevalent! Thanks for sharing your beautiful table with us! Hi, Elaine!!! Thank you for stopping by! I try not to spend too much money, and since the whole Savannah debacle I haven’t really been able to spend any at all. I feel blessed to have had a pretty healthy repertoire left over from my recent days of owning a retail wedding rental boutique. I retired a couple of years ago and sold about 90% of the inventory, but you just know I had to keep some goodies for myself! 😉 We are blessed in that there is ample storage here at home to keep everything. (I have carved out a lot of extra space in unmentionable places! :-)) I always look for new ways to present stuff. Right now I’m on a spray paint kick since I can’t afford to go out and buy new stuff. Pray for us….I get crazy with a can of spray paint! 🙂 Have a great weekend, and thanks again for stopping in! Thank you, Shel! I appreciate that so much! I hope you have big plans and are able to enjoy your weekend!!! Alicia, the colours you have chosen today are just stunning. Wonderful!! I’m a great lover of white so loved the white pumpkins. The green orchid with reindeer moss looked wonderful. Loved the chartreuse/white/brown for the event. Hi, Summer! Thank you!!! There’s just something about reindeer moss that’s so appealing…I can’t resist it! I’m not so fond of the red reindeer moss, but I’m sure it would grow on me if I found something cool to do with it. Have a great weekend, and thank you for stopping in! Thank you! They are my favorite! I kind of get sick of them after the long winter months when I’m stuck inside with that being my only option, but I always come back to loving them again. Have a beautiful weekend! Beautiful and elegant, Alycia…the centerpiece is stunning. It’s a distinct possiblity we were separated at birth! 🙂 I have often thought that myself! Thank you for stopping in, and have a fabulous weekend! Hi, Kelly! Thanks for peeking in! The florals can’t touch yours by miles, but I’m glad you like it! Who would have thought that something with pumpkins would look so elegant? 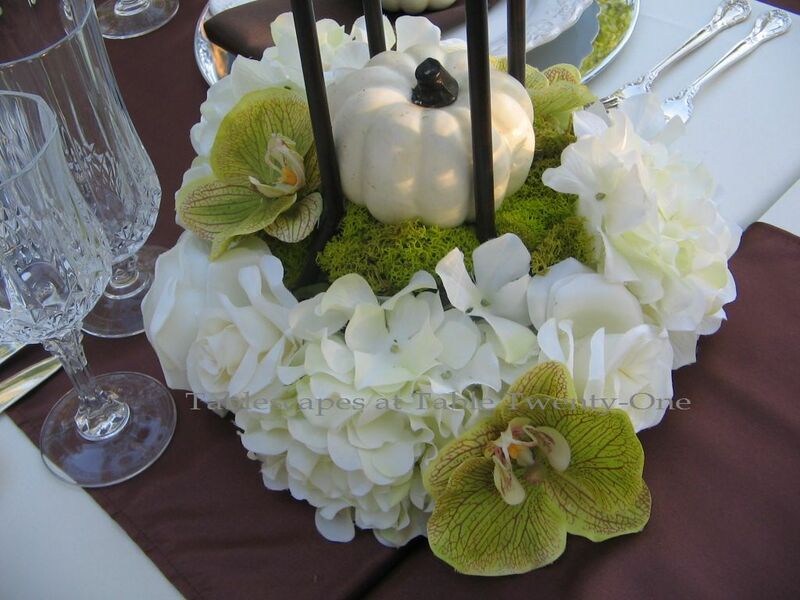 But this sure is very elegant, imlove the mix of brown and white and I really like the white pumpkins. Thank you, Christine! I hope you have a wonderful weekend!!! 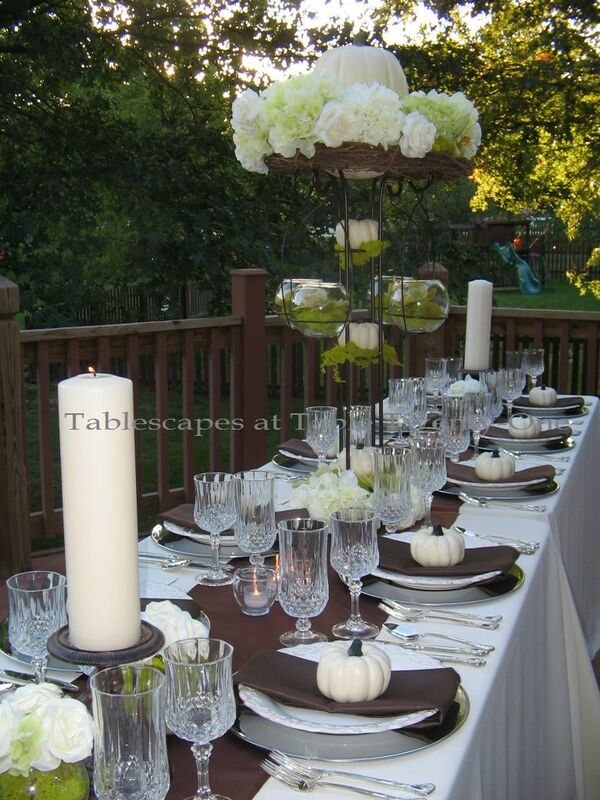 What a gorgeous, fall table! You have inspired me. Good morning….darn near afternoon…, Jane! Thank you so much! Now, your talking.. HOw I wish you are my decorator when I celebrate my 25th Wedding Anniversary together with my 50th yrs bd in 2014. Happy w/end my dear friend. Hi there, Chie! Thank you so much for coming to see me! I’m bored this weekend and so glad to get a nice visit from you! Enjoy your weekend!!! Hi, Jenny! Thank you! I had to tear it down, of course, because it was outdoors. I’m having a girls night in here tonight with completely different decor, but will recreate that table in the morning so it will be set up by the time I go to pick him up from the airport. Whew! The table decoration is just done so impeccably well, it seems a shame to ruin it with the food!